Lovely voices and volcanic mountains characterise Sao Vicente, the most sophisticated island of the Cape Verde archipelago. 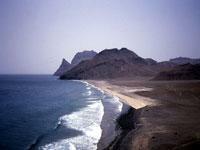 It is the home of Cape Verde's most famous singer, Cesária Évora, renowned as the 'barefoot diva'. Sao Vicente was discovered in 1462 but remained virtually uninhabited until the middle of the 19th century due to the lack of water on the island. It is now a bustling cultural centre for Cape Verde. The port city of Mindelo is the cultural capital of Cape Verde, and is home to over 90 percent of the population of Sao Vicente, as well as a number of interesting markets, a few picturesque colonial-style government buildings, and restaurants serving delicious local cuisine like catchupa stew. Mindelo has a lively nightlife all year long, but truly comes alive each March for Carnaval, one of the biggest parties in Cape Verde. The island boasts beautiful beaches too, particularly the Baia das Gatas lagoon that has been formed by volcanic activity, and the long, sandy stretch of Sao Pedro beach, sought out by windsurfers. The island is not particularly green due to being dry but it is attractive in a rugged way and there are interesting hikes to be done in the mountainous areas.